SUBHEAD: Sea Shepherd catches Japanese poaching fleet with dead minke whale in Australian Whale Sanctuary. 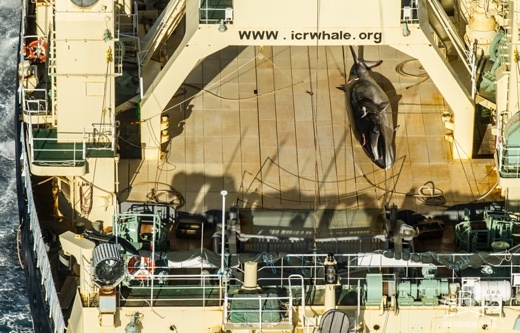 Image above: Slaughtered minke whale on deck of Japanese "research" vessel. From Sea Shepherd.org. After five weeks of patrolling the Southern Ocean, Sea Shepherd has located the Japanese whale poachers’ factory whaling vessel in the Australian Whale Sanctuary with a dead minke whale on its flensing deck, the first to be documented since the International Court of Justice ruled against their whaling operations in the Antarctic in 2014. The Nisshin Maru was spotted by the helicopter of Sea Shepherd’s MY Steve Irwin at 12:34AM GMT (11:34AM AEDT) at a position of 64 57.6S - 085 09.6E, within the Australian Whale Sanctuary. When the helicopter approached, the Nisshin Maru crew scrambled to hide the slaughtered whale with a tarp, while the fleet’s harpoon ships Yushin Maru and Yushin Maru #2 quickly covered their harpoons. 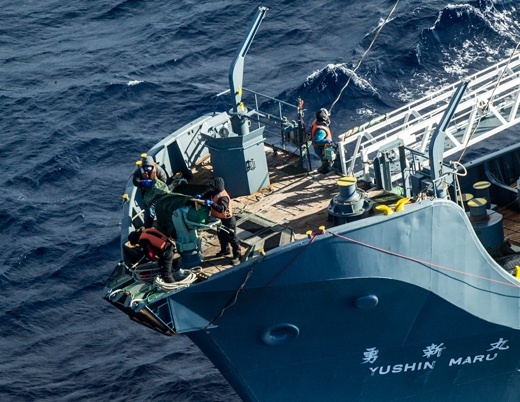 "The whale killers from the Nisshin Maru were caught red-handed slaughtering whales in the Australian Whale sanctuary,” says Captain Adam Meyerson of the Ocean Warrior, Sea Shepherd’s newest Southern Ocean patrol ship. “The Steve Irwin has shut down their illegal operations and caught them trying to hide the evidence." Image above: Crew covers harpoon gun with tarp as Sea Shepherd helicopter nears Japanese whale hunting vessel Yushin Maru. From SeaShepherd.org. Sea Shepherd’s discovery of the factory ship and the slaughtered whale comes just a day after Japan’s Prime Minister Shinzo Abe was in Australia on an official state visit. Jeff Hansen, Managing Director of Sea Shepherd Australia stated, "The lack of action by the Turnbull government while whales are being killed in Australian waters just a day after Japan's Prime Minister was on a state visit in Australia shows that the government has no spine when it comes to protecting the wishes of Australians to defend the Southern Ocean Whale Sanctuary." Sea Shepherd’s helicopter has relayed the whaling fleet's position to the MY Steve Irwin, now on an intercept course with the factory ship. No more whales will be killed today. Operation Nemesis is Sea Shepherd’s 11th Antarctic whale defense campaign. In Sea Shepherd’s past ten campaigns over 6,000 whales have been spared the grenade-tipped harpoons of the illegal Japanese whaling fleet. Japan’s so-called “scientific research” program used to justify the killing of whales has been rejected by the International Court of Justice and the International Whaling Commission’s scientific committee. In 2015 the Australian Federal Court fined the Japanese whalers $AU1 million for hunting within an Australian whale sanctuary, however it remains unpaid.